The family who own the building that Banksy's latest Brexit inspired mural is on have been given 'permission' by the artist to sell the £1 million piece. The mural, which depicts a main removing what is presumably the star representing Britain from the EU flag, appeared in Dover on the side of an abandoned amusement arcade, owned by the Godden family. Back in 2014, Banksy chose another of the Godden family's property to create his piece Art Buff on. The piece on the family's Folkestone property saw the artist and Goddens go to court, with the Goddens losing the High Court case. Barton was involved in Goddens’ first attempt to sell a Banksy, a piece called ‘Art Buff’. The charity running the Folkestone Triennial arts festival launched legal action to get it back, and it transpired that the Goddens were tenants of the building but not freeholders, a technicality that invalidated their right to sell. 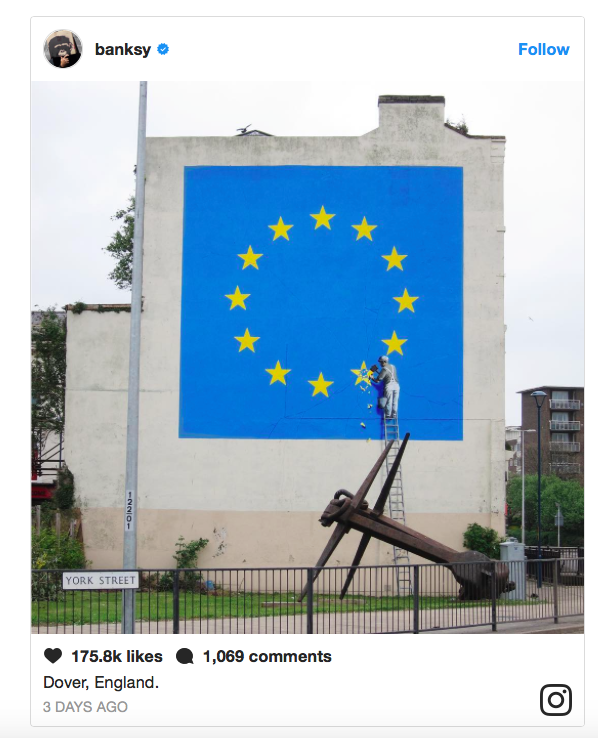 Banksy's spokesperson has confirmed the EU mural is indeed by the elusive street artist. Since the piece was finished by Banksy, it has been vandalised with the words ''The Clash,'' which has lead to Dover District Council monitoring the mural with CCTV.